A structure; usually located on the roof of a building, over which water is circulated so as to cool it by evaporation.Device that dissipates the heat from water-cooled systems by spraying the water through streams of rapidly moving air. Cooling towers can be substantial water users and, as such, present an opportunity for water conservation. a device for cooling water with atmospheric air. Modern cooling towers are used primarily in industrial circulating water systems for lowering the temperature of water carrying off heat from heat exchangers and compressors. The cooling takes place mainly through the evaporation of some of the water that flows from the sprinkler in the form of films or drops under the force of gravity (the evaporation of I percent of the water lowers its temperature by approximately 6° C). Cooling towers are classified according to the kind of sprinkler as film, dropping, or spray types and according to the air-supply system as fan, tower (in which an air draft is created by means of a high exhaust tower), or open (or atmospheric) towers, which utilize wind power and, in part, natural convection for the passage of air through the sprinkler. Fan cooling towers may be of the sectional or separate free-standing type. This kind of tower provides more thorough and stable cooling of the water and permits greater specific heat loads than the tower and dropping types, but it consumes additional electric power. The capacity of a cooling tower is characterized by the density of sprinkling—the specific flow rate of the cooled water per square meter of the sprinkling area. The type, dimensions, and basic components of cooling towers are determined during the design stage by technical and economic considerations, depending on the amount and temperature of the water to be cooled and the parameters of the atmospheric air. Berman, L. D. Isparitel’noe okhlazhdenie tsirkuliatsionnoi vody, 2nd ed. Moscow-Leningrad, 1957. Gladkov. V. A., Iu. I. Aref’ev. and R. A. Barmenkov. Ventiliatornye gradirni. Moscow. 1964. A towerlike device in which atmospheric air circulates and cools warm water, generally by direct contact (evaporation). 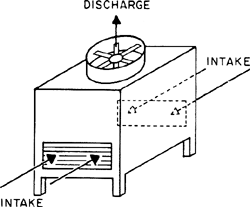 A tower- or building-like device in which atmospheric air (the heat receiver) circulates in direct or indirect contact with warmer water (the heat source) and the water is thereby cooled (see illustration). A cooling tower may serve as the heat sink in a conventional thermodynamic process, such as refrigeration or steam power generation, or it may be used in any process in which water is used as the vehicle for heat removal, and when it is convenient or desirable to make final heat rejection to atmospheric air. Water, acting as the heat-transfer fluid, gives up heat to atmospheric air, and thus cooled, is recirculated through the system, affording economical operation of the process. Two basic types of cooling towers are commonly used. One transfers the heat from warmer water to cooler air mainly by an evaporation heat-transfer process and is known as the evaporative or wet cooling tower. Evaporative cooling towers are classified according to the means employed for producing air circulation through them: atmospheric, natural draft, and mechanical draft. The other transfers the heat from warmer water to cooler air by a sensible heat-transfer process and is known as the nonevaporative or dry cooling tower. Nonevaporative cooling towers are classified as air-cooled condensers and as air-cooled heat exchangers, and are further classified by the means used for producing air circulation through them. These two basic types are sometimes combined, with the two cooling processes generally used in parallel or separately, and are then known as wet-dry cooling towers. Evaluation of cooling tower performance is based on cooling of a specified quantity of water through a given range and to a specified temperature approach to the wet-bulb or dry-bulb temperature for which the tower is designed. Because exact design conditions are rarely experienced in operation, estimated performance curves are frequently prepared for a specific installation, and provide a means for comparing the measured performance with design conditions. A structure, usually on the roof of a building, over which water is circulated, so as to cool it evaporatively by contact with air. A well-maintained cooling tower is critical to reducing the risk of Legionnaires' disease," said Health Commissioner Dr. 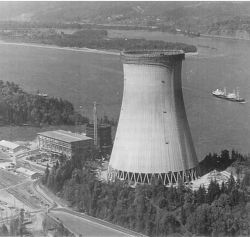 The turbines were placed at a predefined position in cross-wind orientation facing the discharged wind from the cooling tower fan. The waste heat that cannot be recovered makes its way through the ERW loop first to the TSC, where it is rejected sensibly to the atmosphere; and then to a plate-and-frame heat exchanger connected to the cooling tower loop, where the waste heat is rejected evaporatively to the atmosphere. In the process of circulating water cooling in the cooling tower during its run-off along the cooling surface and aeration with counter vapor flow (saturation with C[O.
replaced an open cooling tower with two closed-loop fluid cooler systems that supply water to combined chiller/TCU units in their injection molding operation. Since chemicals, additives and fresh water treatment are some of the largest variable costs for cooling tower operation, optimising purge and make-up rates is important. Eliminating the gearbox from the cooling tower system increases efficiency levels as the power from the motor is transferred directly to the fan with virtually no losses. The chart is based on a 1000-ton (4,400kw) cooling tower, and indicates water savings level out around seven (7) cycles. Hence, whether clients wish to utilize cooling towers for the centralized air-conditioning plant of their buildings or dissipate the heat from the processing plant or even cool water in an industrial complex, Towertech is committed to serve. Managing the risks from legionella in cooling towers and evaporative condensers used to provide chilled water to service manufacturing processes is essential to ensure the safety of workers.